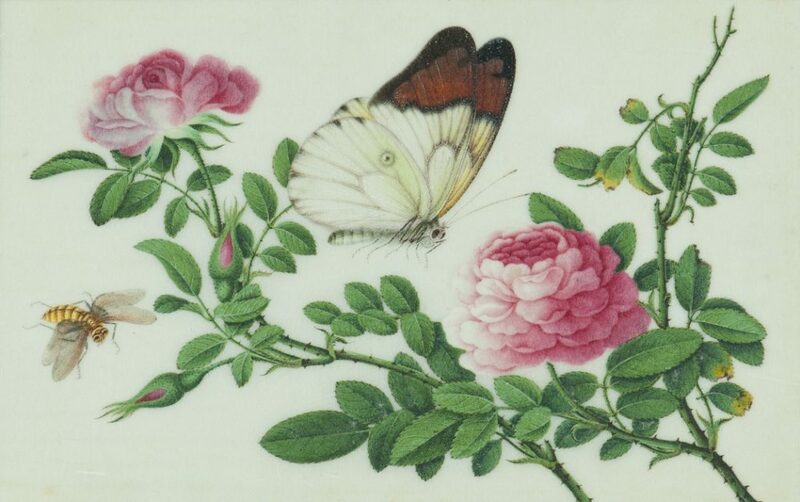 Botanical drawings and paintings have been seen in Chinese art since Neolithic times. Not only are attractive flowers, birds, and insects used for decoration, but the subject-matter is also loaded with a multitude of symbolism. A proliferation of “bird and flower” painting in the Song dynasty (960-1279) cemented the popularity of floral images as a genre in Chinese art. This thematic category is seen not only on scroll paintings but also on three-dimensional works of art such as porcelains, lacquerware, jade carvings, textiles, furniture and many others. 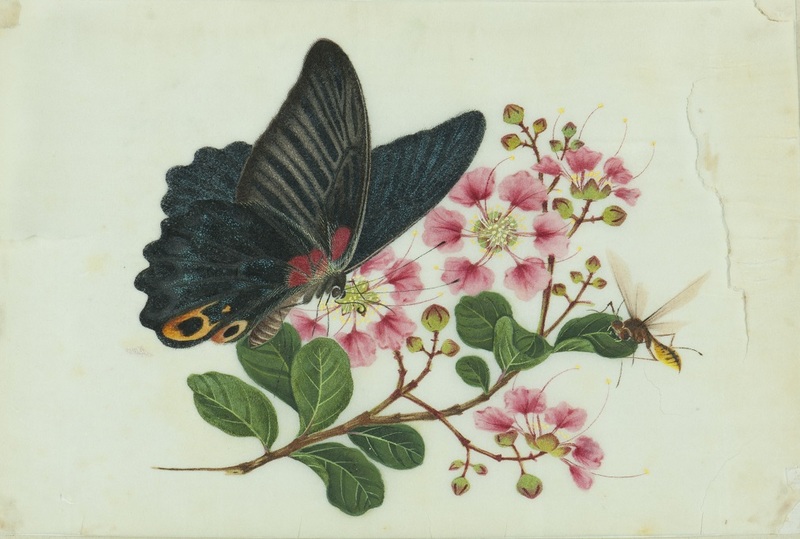 With the approach of Spring, we have chosen an album of 19th-century paintings from the AGGV’s Asian Art collection to explore the symbolism of flowers in Chinese art. 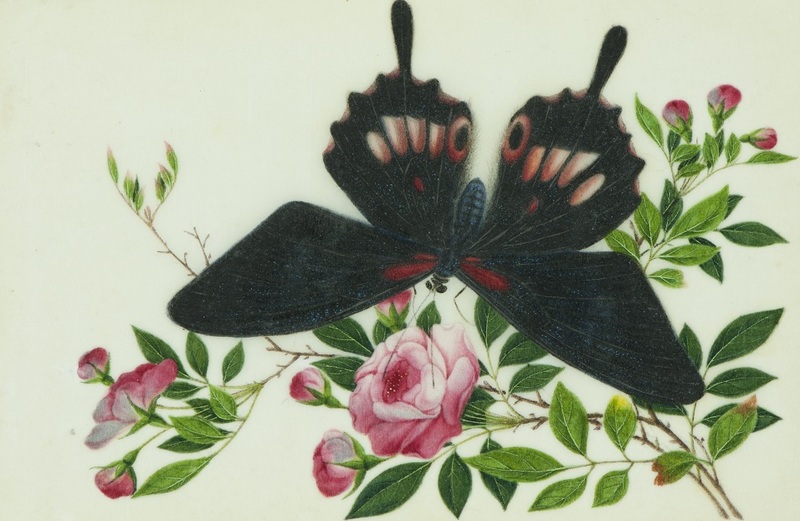 All of the paintings in this album show botanically accurate depictions of flowers and a variety of butterflies. The combination very likely emerged in the 18th century, decorating wares that were commissioned as birthday gifts. 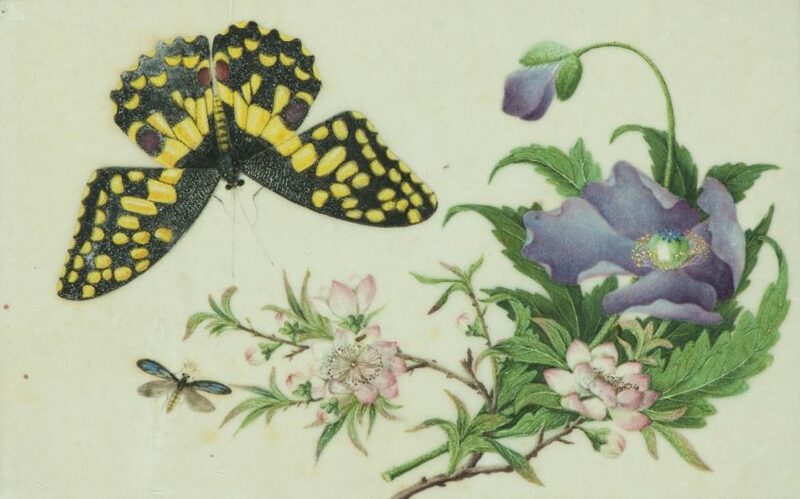 Butterflies have several meanings, including a rebus which repeats any auspicious wish. They are also associated with longevity, and as such make appropriate birthday symbols. 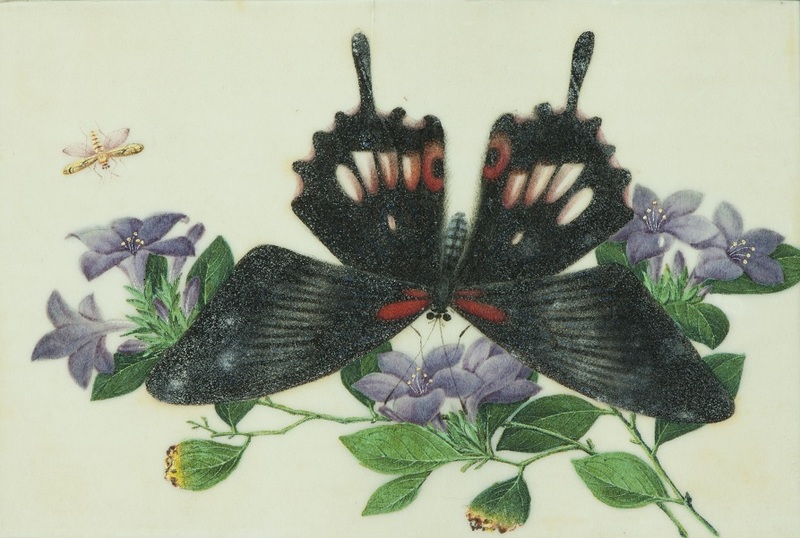 In Daoism, butterflies represented the freedom of the soul. Combined with the floral motifs, these paintings suggest many auspicious things. The poppy is symbolic of faithfulness and loyalty between lovers, according to Chinese folklore that tells the tragic story of two lovers separated by war. Poppies feature in the tale, as the flowers that sprung up where the wife committed suicide upon her husband’s demise at war. Camellias bloom during the Chinese New Year (late January – mid February) and the flowers are used to decorate the home for the festival to usher in good fortune in the new year, as suggested by the idiom huakaifugui 花開富貴. Roses tend to be depicted on wares for export where the blossom was more popular in Europe. The Chinese rose is sometimes called ‘the eternal spring flower’ as it blossoms frequently throughout the year and consequently is associated with longevity. With its vivid purple-blue trumpet-shaped flowers, the morning glory was first used as a decorative element in 15th-century Ming blue-and-white wares. The flower is said to represent marital bliss. Different varieties of azalea blossom in China. The flower symbolizes feminine beauty in painting, and when the azalea is paired with butterflies, the symbolism they form means ‘creative ability in art’.